You can bay first quality fresh fish (bass) every day in Janjina (30 m from center) 60 kn/kg (8 EUR/kg). The same fish cost 200 kn/kg (26 EUR/kg) in restaurant. Every holiday house have open-air barbecue. Good appetite! On Adriatic coast after summer North-eastern wind (croatian: Bura) and South wind (croatian: Jugo) temperature of sea decrease and if you sensitive to the cold, you would to wait one-two days to temperature of sea increase. But "Peljesac Parasise" have warm sea at least on one side of Pelješac always! After rare summer North-eastern wind (croatian: Bura) go on The Little Sea (north side of the peninsula) for one-two days and after rare South wind (croatian: Jugo) go on The Great Sea (south side of the peninsula). 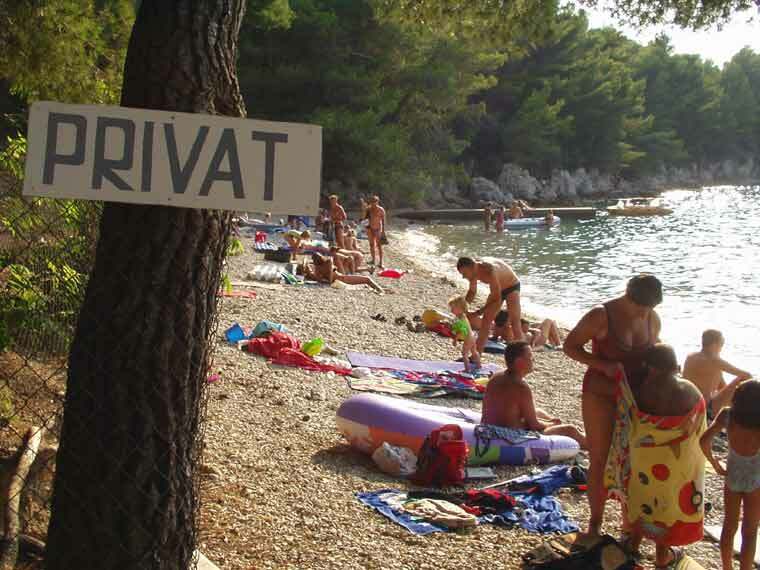 There are no private beach in the Peljesac Paradise, don't distrub yourself if you find title like this. But a land over beach is generally private. Vine give fewnes grapes (specially on the Great Sea) but very qualitative (with big price) therefore owners of vineyard worry if someone encash only one bunch of grape. Kuna (1 Kuna = 100 Lipa). There are 1, 2, 5, 10, 20, 50 Lipa coins, 1, 2, 5 and 25 Kuna coins and 5, 10, 20, 50, 100, 200, 500 and 1,000 Kuna banknotes. Foreign currencies can be exchanged at banks, exchange offices, post offices and at most tourist agencies, hotels and camping grounds. Banking hours are 7 a.m. to 7 p.m. from Monday to Friday. On Saturdays banks are open until 1 p.m. In the larger cities some banks are also open on Sundays. Credit cards: Most hotels, restaurants and shops accept credit cards (American Express, Diners Club, Eurocard/Mastercard, Visa, Sport Card International). Cash dispensing machines are ubiquitous. Diplomatic consulates of the Republic of Croatia abroad or the Ministry of Foreign Affairs of the Republic of Croatia. Tourists making purchases in Croatia (apart from petroleum derivatives) which exceed 500 Kuna per receipt may reclaim VAT ("PDV"). At point of purchase the sales person will provide on request a form PDV-P, which should be filled out and stamped, on the spot. On leaving Croatia the receipt must be verified by the Croatian Customs service. A PDV refund in Kuna can be obtained within six months, either at the same shop where the goods were purchased (in which case the tax is refunded immediately), or by posting the verified receipt back to the shop, together with the account number into which the refund should be paid. In this case the refund is dealt with within 15 days of receipt of the claim. Credit cards: accepted in almost all hotels, marinas, restaurants, and shops( American Expres, Diners, Eurocard/Mastercard, Visa). There are hospitals and clinics in all larger cities and first aid clinics and pharmacies in all places. Foreign tourists do not pay for medical services if the Health Care Convention was signed between Croatia and the country they come from. Expenses of health services provided to persons coming from the countries with which the Health Care Convention was not signed are charged directly to users according to the price list. There are hospitals and clinics in all the major towns, and health centers, as well as pharmacies, in all the smaller places. For patients whose lives are in danger, there is emergency transport by air(helicopter) or sea (speadboat). There is a network of veterinary clinics and centres in Croatia. 1 January - New Year's Day; 11 and 12 april - Easter, including Easter Monday; 1 May - Labour Day; 10 June - Corpus Christi (Movable feast); 22 June - Anti-Fascist Resistance Day; 25 June - Statehood Day; 5 August - Victory Day and National Thanksgiving Day; 15 August - Assumption; 8 October - Independence Day; 1 November - All Saints' Day; 25 and 26 December - Christmas Holidays. Shops and department stores are open between 8 a.m. and 8 p.m., and on Saturdays from 8 a.m. to 2 p.m., or to 3 p.m. A smaller number of stores close between noon and 4 p.m. Many stores are also open on Sundays, especially in the summer, and a smaller number in the larger cities are open 24 hours a day. Public services and companies usually work from 8.30 a.m. to 4.30 p.m. from Monday to Friday. Post Offices are open from 7 a.m. to 7 p.m., and on Saturdays until 1 p.m. There are Post Offices in the larger cities which are open until 10 p.m. in the summer. Postage stamps are sold in Post Offices and at newsstands. Public telephones can be used only with phone cards, which can be purchased in Post Offices and at newsstands, in hotels and tourist complexes. Ensure that you have done everything to prevent a fire! Do not throw lit or flammable objects into the environment! If you see a fire, please inform others in your proximity; report it immediately on the telephone number - 93; try to extinguish the fire till the fire-fighters arrive and in such a manner so as not to endanger yourself or others! Take notice of signs forbidding the lighting of fires! Take care that your parked vehicle does not obstruct accesses to the fire or roads! This service is available in Croatian, English, German and Italian from the 1st of April until the 30th of October. On Program 2 of Croatian radio, along with the regular news in Croatian, the Croatian Auto Club (HAK) will give traffic reports in English, German and Italian along with nautical news a number of times throughout the day.